Heat up the pan, add oil, then Brenpa’s Mindful Sauce, and add cooked boiled potatoes. Mix them well and let it cook for 7 mins. Enjoy ! Alu Khatsa is one of my favorite dish from childhood. 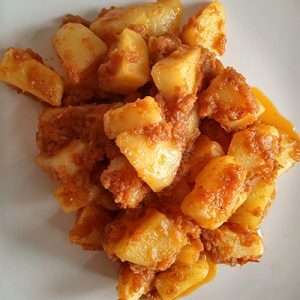 I grew up in a boarding school for refugees in India, the foods at the time were pretty bland and if you are lucky and you happened to get hold of some chili peppers/powders and if the food happened to be potatoes – we make Alu Khatsa. Alu in Hindi ( Hindustan Language) means potato and Kha in Tibetan language means mouth and Tsa meaning Hot or spicy. So it’s literally translates to Hot Mouth Potato or I like to call it Spicy Potato. May the goddess of spice keeps your life interesting and full of fun ! alu khatsa, brenpa's kitchen, cooking, generosity, gift, Mindful Chili Sauce, potato, Recipes, share, spicy, vegetarian. Bookmark.